(June 27, 2001) -- Members of City Hall's appointed Recreation Commission have sent the City Council a non-official advisory letter stating their opposition to expanding a North Division LBPD facility in Scherer Park. However, the Recreation Commissioners (Mayor nominated, Council approved) added that if the Council approves expanding the LBPD facility into Scherer Park, the loss of Scherer Park land should be mitigated by providing additional NLB park land on at least a one to one ratio. Opposing the Scherer Park site challenges City Hall, but proposing to mitigate lost park land with park land elsewhere is consistent with public positions already taken by the Planning Commission and district Councilman Rob Webb. Both are on record as supporting the project as long as City Hall provides "replacement" land elsewhere. "[T]he Commission unanimously voted at its June 21 meeting to oppose the project because it would significantly reduce park land. While we realize that this decision has no official status, we do feel that you should be made aware of our concerns about this project in a public park. In addition, if the project does move forth, we strongly feel that the loss of park land in Scherer Park must be mitigated (as suggested in the Environmental Impact Report) with additional park land in the North Long Beach area on at least a one to one ratio." The letter is signed by Recreation Commission president William Marmion, Ph.D, Vice President Bea Antonore and Commissioners William Clark, Naomi Rainey, Chris Kozaites and Ralph Hurtado. It is cc:'d to City Attorney Robert Shannon, City Manager Henry Taboada, Assistant City Manager Gerry Miller, Deputy City Manager Reginald Harrison, Parks, Recreation and Marine Director Phil Hester and Planning and Development Manager Dennis Eschen. Much of the Recreation Commissioners' letter is devoted to voicing their displeasure with a City Attorney memo advising that the Commission lacks jurisdiction over park land use decisions. The City Attorney office's memo (attached to the letter and included on our link above) by Deputy City Attorney Mike Mais interprets the Charter in a way that leaves park land use decisions the responsibility of elected Councilmembers, not appointed Recreation Commissioners. Park advocate Ann Cantrell, while commending the Commissioners for supporting Scherer Park, dismissed the notion of taking parts of large, contiguous open space park land at Scherer Park and "replacing" it in bits and pieces elsewhere. "No one would suggest doing this to Central Park in NY or Griffith Park in LA," Ms. Cantrell told LBReport.com. Gigi "Fast Elk" Porter of STOP (Stop Taking Our Parks), who has spearheaded opposition to the Scherer Park site, told LBReport.com she does not consider piecemeal mitigation to comply with CEQA (California Environmental Quality Act) or the CA Public Resources Code. A City Council hearing, and possibly a Council vote on the matter, is now scheduled for July 17, 2001. (The item was continued on June 26 and a previous July 10 date was delayed another week). When the hearing does take place, the Council will hear appeals by Ms. Cantrell, Ms. Porter and Earthcorps President Don May, contesting the Planning Commission's decision approving the Scherer Park site. After taking public testimony pro and con, the Council could move to certify the EIR and change the zoning for part of the Scherer park land to "institutional." City Hall's EIR admits the plan would consume 2.5 acres of Scherer Park land and, in conjunction with past actions including the YMCA, will result in a combined total loss of 4.8 acres of open space. Opponents of using Scherer Park land warn that if the City Council rezones part of Scherer Park as "institutional," it could do the same thing in any LB park. City Hall's EIR admits that "the proposal will visually and physically block a significant amount of the park from view of Atlantic Avenue and Del Amo Boulevard. The building with a pad elevation of 60 feet and building height of 28 feet with visually dominate the park, which will be lot elevation 43 or less...Several mitigation measure are proposed to reduce the proposal's visibility on the park through landscaping with evergreen trees. Even after mitigation, the proposal will result insignificant adverse aesthetic impacts." All sides agree a new North Division LBPD facility is needed and deserved, but park advocates favor alternative sites and oppose carving up Scherer park land in exchange for "replacement" land elsewhere. Councilmembers Rob Webb and Jerry Shultz point to support for the Scherer Park site from their constituent area business groups and neighborhood group leaders who cite increased safety in the park. 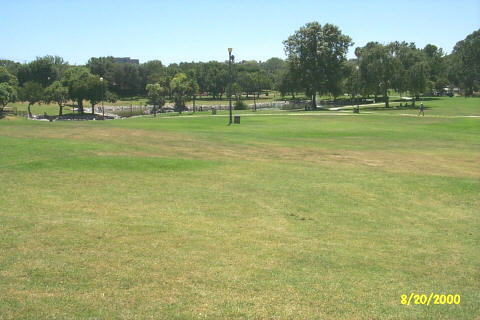 In late August, 2000, after a deadline passed for putting a measure on the ballot that could have substantively preserved park land, Councilman Grabinski agendized discussion of a Municipal Code amendment dedicating "in perpetuity public park land...for park use only." "So this is not going to be what some people wanted...Ann Cantrell would love to have all the voters decide once and for all what goes into parks. And that may happen. That may happen. It's not gonna happen this week, or this month." Grabinski's proposal opened the door to discussing what non-park uses, if any, might be appropriate on park land. Field hearings have been held by the Housing and Neighborhoods Committee hearings but have to date produced no results. In February, 2001 (again at its NLB district meeting) the Council received a progress report on the issue and Councilman Grabinski verbally dissented from the Scherer Park plan. In May, he used Council budget proceedings to question the advisability of the Scherer Park site. As to the Recreation Commission's role in the matter, Commission members said in their letter they believe the City Charter should be amended to provide for Recreation Commission approval "in situations where existing park land is proposed to be converted to other uses." Such an amendment (which would set up a mechanism for approving conversion of park land) is arguably inconsistent with efforts by park preservation advocates who favor a Charter amendment forbidding City Hall from converting existing LB park land for other uses without a vote of the people. Approval of any City Charter amendment would require a vote of the people.